Originally published: New York: Hachette. 'Lauren has changed my life. I can flat-out say that I have never been happier, more fulfilled, or more certain and excited about the path ahead of me' - Hugh Jackman'This book is for people who are ready for change and to face everything holding them back. You're not alone; I'm on the journey too!' - Michelle Williams, Destiny's ChildWhat's standing in the way of your best life? It's not your boss, your mother or your metabolism. maybe it's you. Lauren Handel Zander knows that people are hungry for results-oriented, no-nonsense advice. Someone to tell it to them straight. To give them not only inspiration to change, but a step-by-step plan to get it done. That's what she's done for tens of thousands of clients at Handel Group with her take-no-prisoners brand of radical personal accountability - a proven program that has worked for bestselling authors, top businesspeople, award-winning artists . . . and now, you. 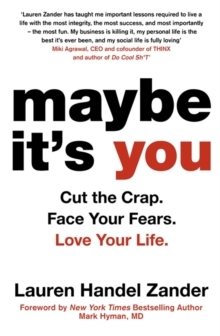 In Maybe It's You, you will finally and forever learn to:*Cut the crap about being 'true to yourself', when you don't have a clue who that is. *Tell the truth and nothing but your truth. *Manage the head you call home. *Get good at keeping promises to yourself. *Find your sense of humour. Yes, it's missing. Whether you want to find love, succeed at work, fix a fractured relationship, or lose weight, Maybe It's You will offer a road map to help you finally get there.